This comprehensive text presents students with a broad overview of news media, covering a wide range of journalistic skills and mediums while helping students develop proficiency in gathering, writing, reporting, and producing the news in multiple formats. 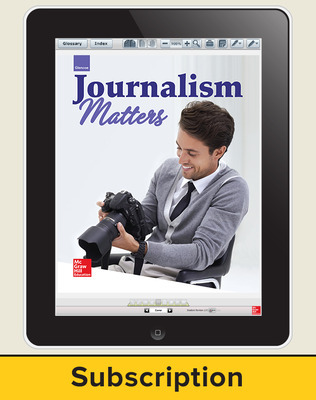 Journalism Matters is designed to introduce students to the world of working journalists. This comprehensive text presents a broad overview of news media, covering a wide range of journalistic skills and mediums while helping students develop proficiency in gathering, writing, reporting, and producing the news in multiple formats. 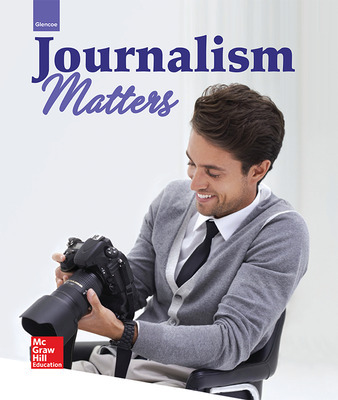 Journalism Matters sparks creativity with engaging content about design, photojournalism, advertising, newspapers, magazines, yearbooks, and television and radio programs. A recurring theme throughout Journalism Matters is the ethical responsibility that journalists hold today. Out Take looks at interesting and sometimes funny stories from the field of news gathering. Dateline provides students with insights into select important historical events in journalism. Your Beat activities provide engaging ways for students to learn journalism techniques. Media Watch activities help students become more conscientious media consumers. Portfolio activities hone students’ writing skills with in-depth written assignments. Finding the Flaw activities build proofreading and editing skills by challenging students to identify common, but avoidable, journalistic mistakes.